Ron’s wife Katy was a patient at Hotel Dieu Shaver Health and Rehabilitation Centre from January 8, 2014 to December 1, 2015, (nearly 2 years) with stage 4 breast cancer. Ron spent every day for those two years travelling from his home in Welland to Hotel Dieu Shaver to visit his wife. Katy was incredibly enthusiastic about the hospital’s Art Therapy program and also enjoyed painting some of the creations made in the Carpentry Shop. Katy required a 2 nurse transfer to get out of bed and into her wheelchair. Being far from home was not ideal but Ron remarks that is was a blessing in disguise as Katy felt at home at Hotel Dieu Shaver and the care was amazing. On December 1, 2015, Katy passed away. 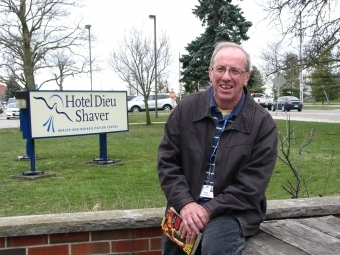 On March 1, 2016, Ron started volunteering with Hotel Dieu Shaver’s Auxiliary. Currently he volunteers in the Nevada booth every Tuesday, but will be training in the Dieu Drop-in Café & Bistro shortly. Ron wanted to volunteer at Hotel Dieu Shaver to give back to the hospital and give thanks for everything that was done for his wife. He also wanted to stay in touch with all the wonderful people he met at Hotel Dieu Shaver. Ron says “patients came and went, but the staff - that’s who I really want to keep in touch with. They were always there and always wonderful.” He names several therapist and nurses, but also all the housekeepers, the kitchen, the therapy staff, and all the nurses. “This is a really special place.” He says he could never repay Hotel Dieu Shaver, but volunteering is a good way to start. Ron is retired from Home Hardware in Welland. He has 4 children - 1 daughter who is a nurse in Renfrew and 3 sons that live in Toronto. Ron is pictured outside of Hotel Dieu Shaver where he and Katy liked to sit on warm days.